The early scenes with the battle against Smaug are quite enjoyable; albeit ridiculously over the top, in a way which recalls the Pirates of the Caribbean movies more than LOTR. After this, the film goes downhill rapidly. TH:TBOTFA covers the last six chapters of the book, 46 pages in my hardcover edition. This is not much story for a two-and-a-half hour film, and Jackson pads it out with interminable action scenes and a couple of subplots. The elves Legolas and Tauriel return; the former, of course, appears in the LOTR films and books, while the latter is Jackson's own invention. Tauriel is a Sassy Badass Female ordered up from central casting. It's an improvement over older stereotypes like Simpering Decorative Female, but a stereotype nonetheless. She defies her king, dares to harbour romantic feelings about a dwarf, and slays orcs by the hundred. That's all very impressive, but she doesn't have any of the flaws or quirks that might give her a personality and cause the audience to care. Another subplot concerns the Deputy Master of Laketown. Scene after scene is used to show off how greedy and cowardly he is, with no additional drama or character development. It is mildly amusing the first time, by the fifth I was wishing someone would chop off his head and save us from the tedium. The contrast with the magnificent, sneering, scheming Wormtongue in the LOTR films is painful. Beorn does appear in the film, but only for about thirty seconds, and he is not even identified by name. If you're going to make a fantasy book into an epic action film, failing to make use of a mighty warrior bear is quite inexplicable. Alas, Jackson was too busy with ideas of his own devising. Some of these work. The last, desperate stand of the Men of Esgaroth against the orc army is pretty well done, although it lacks the emotional punch of the Battle of Helm's Deep. Others are just embarrassing. The aforementioned dwarf Dain is played by a certain well-known Glaswegian actor, so he head-butts his enemies. This might be a good joke, except he successfully uses his bare forehead to batter orcs wearing iron helmets into submission. At moments like this, the film tips over into farce. This does not sit well with the grim brutality of other scenes. Certain dwarves turn out to be all too mortal, which is consistent with their fates in the book. It is hard to stomach arbitrary changes in storytelling style, such that some characters can die while others do not risk so much as a headache. The Return of the King film is infamous for its long, multi-part ending, and the same thing happens here. 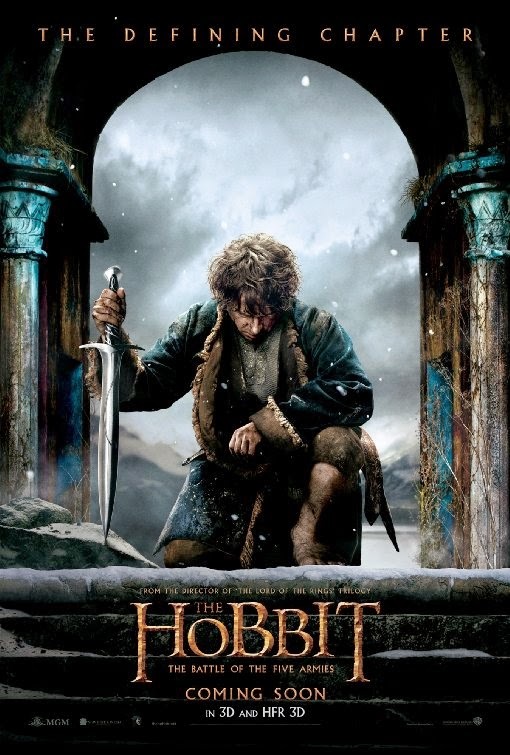 The first three stages at least follow the spirit of the book: Bilbo says goodbye to the surviving dwarves at Erebor, then to Gandalf on the borders of the Shire, then arrives home to find he has been presumed dead, and is just in time to save his possessions from being auctioned off. Ending there would have been reasonable. Instead Ian Holm is dragged into the picture, and plays the older Bilbo in a ham-handed segue into the vastly superior Lord of the Rings films. I would have preferred if Jackson stayed closer to the ending of the book, which had the old dwarf Balin visiting Bilbo in the Shire, years after the Battle of Five Armies. This would have been a chance to drop hints about Bilbo's obsession with the Ring, and Balin's ill-fated plans to lead a company of dwarves to Moria. It also would have played up the friendship between Bilbo and Balin, which is at the emotional centre of this story. Sadly, it was not to be. TH:TBOTFA is a woeful disappointment. Jackson has taken the LOTR template and made everything bigger, louder, and sillier, but he has singularly failed to make it better. Quite so. :-) There was a really good 2.5 hour film lurking in that trilogy somewhere, maybe even a 4-hour double feature, but more is not necessarily better. Someone worked out that if the Hobbit films had the same ratio of page count to running time as LOTR, the Hobbit would have been almost exactly 2.5 hours. By coincidence, I'm currently working my way through the Harry Potter DVDs as someone at work was horrified I had never read or seen them, and (albeit I've not read the books so I can't be sure) I'm sort of coming to the reverse conclusion: that the films must be compressing the story so much that it just doesn't make sense, except perhaps as an aide-memoire for those who have read the books. Interesting -- I read the books before seeing the films so I can't be sure, but I imagine that's true. Books 1-3 are fairly slim and may not be so bad, but 4-7 are doorstops and I think they had to be compressed pretty severely for the screen.